Adapted from King Arthur Flour, after a recipe by Jon Graber, Brewmaster, Mt. Hood Brewing Co.
Preheat oven to 375 F. Melt butter and let cool. Sift all dry ingredients together into large mixing bowl. In a separate bowl, whisk together eggs, melted butter and beer until well-blended. Grease the donut pan with a generous amount of butter or shortening (can also use mini bundt pan). Pour the liquid blend into the dry ingredients all at once, and mix just until blended (do not overmix, or the donuts will be tough). Fill each donut form half full. 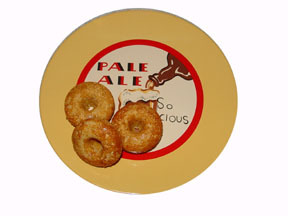 Bake in the preheated oven in the middle rack for 8-9 minutes for mini donuts, 9-12 minutes for regular size donuts. The donuts should not be browned on top. Remove pan from oven, let cool for a minute, remove from pan and roll in powdered sugar. Yields 6 regular donuts, or 24 mini donuts.